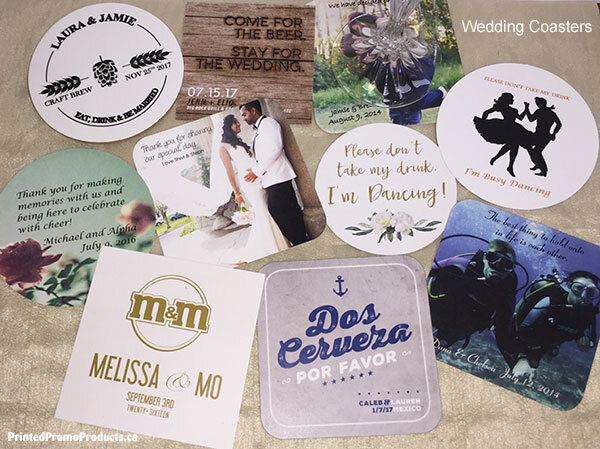 Custom printed drink coasters make great save the date notices, bachelor/bachelorette gifts and wedding thank you’s. We make a wide range of paper beer coasters in light weight to heavy weights in white coaster board and brown kraft board. We also make acrylic, hard top, cork and rubber wedding bar coasters. Visit our Coasters page for more details and pricing. If you have any questions please contact us, we’re here to help. Foil stamping and embossing available.